[140 Pages Report] The data center virtualization market was valued at USD 3.24 Billion in 2016 and is expected to reach USD 8.06 Billion by 2022, at a Compound Annual Growth Rate (CAGR) of 16.5% during the forecast period. The base year considered for the study is 2016 and the forecast period is from 2017 to 2022. The research methodology used to estimate and forecast the data center virtualization market size begins with capturing data of key vendor revenues through secondary research, such as annual reports, white papers, certified publications, databases, such as Factiva and Hoovers, press releases, and investor presentations of Data Center Virtualization vendors, as well as articles from recognized industry associations, statistics bureaus, and government publishing sources. Vendor offerings are also taken into consideration to determine market segmentations. The bottom-up procedure has been employed to arrive at the overall global market size from the revenues of key market players. 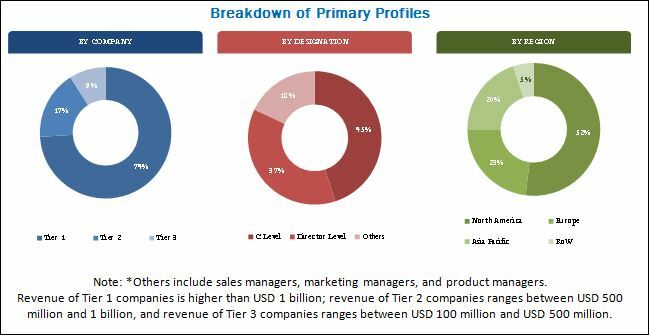 After arriving at the overall market size, the total market was split into several segments and subsegments, which were then verified through primary research by conducting extensive interviews with key individuals, such as Chief Executive Officers (CEOs), Vice Presidents (VPs), directors, and executives. Data triangulation and market breakdown procedures were employed to complete the overall market engineering process and arrive at the exact statistics for all segments and subsegments. 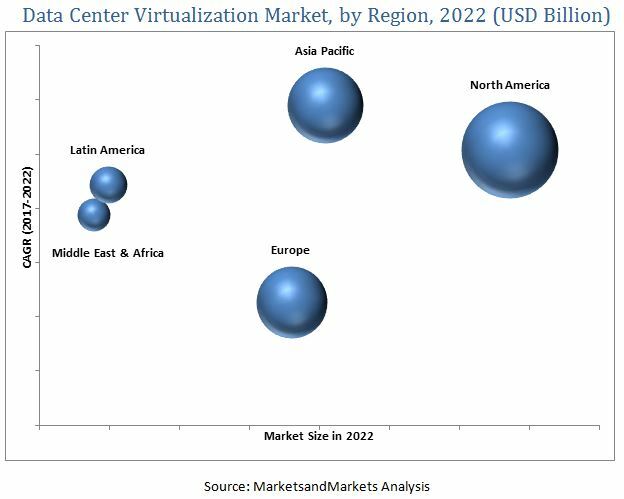 The Data Center Virtualization market ecosystem includes key players, such as the VMware (US), Microsoft (US), Citrix Systems (US), Adobe Systems (US), Amazon Web Services (AWS) (US), Cisco Systems (US), Fujitsu (Japan), Radiant Communications (Canada), HPE (US), AT&T (US), Huawei (China), HCL (India), and IBM (US). The data center virtualization market is estimated at USD 3.75 Billion in 2017 and is projected to reach USD 8.06 Billion by 2022, at a CAGR of 16.5% from 2017 to 2022. Key factors propelling the growth of the market include the need to reduce operational costs and enhance business agility of enterprises and demand for unified and centralized management of data centers. The data center virtualization market has been segmented on the basis of type, organization size, vertical, and region. Based on type, the market has been segmented into advisory & implementation services, optimization services, managed services, and technical support services. The optimization services segment of the market is expected to grow at the highest CAGR. Optimization services assist organizations to plan, build, and manage data center facilities. These services also help organizations improve operational efficiency and performance as well as enhance network security. Thus, benefits associated with the adoption of optimization services are projected to drive the growth of the optimization services segment of this market. Based on organization size, the market has been segmented into large enterprises and SMEs. High initial capital requirements associated with on-premises data centers have propelled SMEs to focus on off-premises/cloud data centers, thereby propelling the demand for off-premises/cloud data center virtualization services. This, in turn, is projected to drive the growth of the SMEs segment of the data center virtualization market. North America is estimated to be the largest market for data center virtualization in 2017, as organizations in this region are early adopters of the data center virtualization technology. Additionally, the presence of key market players in this region, such as VMware (US), Microsoft (US), Amazon Web Services (US), and Citrix Systems (US) is also driving the adoption of the data center virtualization. This region is also experiencing very high cloud adoption, and cloud service providers are expanding and improving their infrastructure by adopting virtualization services. Many other organizations are opting for data center virtualization to increase agility, scalability, and flexibility of their private data centers, which, in turn, is expected to drive the growth of the data center virtualization market in this region. A key restraining factor that affects the growth of the data center virtualization market is data center localization. Thus, stringent laws related to data center localization acts as a restraint to the growth of the market, as data center virtualization service providers consistently need to keep up with changing regulatory compliances and upgrade their solutions and services. The primary challenges for this market include limited awareness regarding the collective benefits of virtualization and limitations associated with the virtualization of legacy IT infrastructure. Key players operating in the data center virtualization market include VMware (US), Microsoft (US), Citrix Systems (US), IBM (US), and Cisco Systems (US). These companies focus on the adoption of various growth strategies such as agreements, partnerships and collaborations, new product launches, and product enhancements to strengthen their market positions in the market.